We ride alone in our own saddle, yes, but even in a darkened room or during a darkened time unless your eyes are glued closed, you know that we also ride together. Sometimes we spin in circles, forgetting where we are heading, which is why it’s helpful to look up at an instructor you trust and mirror their body language until you find the beat again. We can tune out and just ride when the coast is clear but when we need to add on or double time, we can go further and faster wherever people gather and where there is music. The multifaceted wonder of music, that welcome distraction when we feel pain, that subtle builder of endurance, that megaphone to drive us deeper into synchronicity with ourselves. In a world of nonstop talk, we forget that our ride does not depend on our ears or tongue. It's the position of our feet, clipped in and pedaling one push at a time, and our hands, open and not gripping too tightly, as we learn to build our core strength. We can skate through, cheating our resistance dial, or we can choose to give it our all where we are guaranteed to get soaked in sweat but where we know it's the only way to find the zone. The zone, where effort feels momentarily effortless and your Everest feels possible, isn't a place where we can live permanently but isn't it glorious to know we can pass through from time to time. Life is a beautiful ride, yes, but it’s only when you get out and ride through headwinds, heartbreak hills, and heat that the promise finally makes sense. Peanut M&Ms and sports trivia used to be our currency of choice when trying to get our boys, one boy in particular, to soldier on for family hikes (see above.) I was remembering those years of vociferous reluctance and bribery during our recent 7 day hiking trip to Slovenia. My position on family hikes has always been the caboose, in part because I like taking pictures and because in those early years one parent needed to fence in any attempted escape back to the car. In Slovenia however, I pulled up the rear because try as I might, I couldn’t keep up. After years of hiking exposure, that boy in particular is now the young man who bounds ahead and waits for the rest of us. And this time it was me not them that needed cajoling to carry on. It’s a funny thing, those inversion moments with your children, where they are the ones whispering in your ear: “You can do it” when you’re sure you can’t. Twice I found myself crouched on a mountain paralyzed by my overbearing fear of heights and twice my children came to my rescue, not with peanut M&Ms, but with an unwavering confidence in me. I, not gracefully or without tears, did eventually do it. They then hovered around me until they knew I was comfortable again before they raced ahead to the next climb. My boys have now traveled to 29 countries. A lot of those first trips, like our early hikes, were hard because they were young and not entirely flexible. None of our trips were a waste but some were sacrificial. When we set out on this commitment 5 years ago to spend our time and money on travel, we hoped that the exposure to new cultures and experiences would make them more adaptable and curious about the world. I admit that personality, and maybe even parenting, plays a large role in how travel experiences are ingested but the mere experience of seeing a new part of the world is enough to crack open children's natural curiosities. It seems unlikely that without that unwavering commitment they would have passed the hours hiking in Slovenia by quizzing each other -- without parental involvement -- not only on NBA stats but mostly on African capitals of the world. Or that they would start to genuinely love it when we, no longer embarrassing parents, stopped to talk to a local and asked bare (North London slang for "very") questions. Or that they would be willing to eat whatever was on the chef’s menu, even if that menu wasn’t in English or the ingredients weren’t recognizable. And in Slovenia, they eat bear ... thank goodness we got the venison. Family travel is a muscle that requires exercise and like hiking, there is a point at which you as the parent will lag behind because they have become fitter than you. Enjoy the view while you still have them in sight. Everyone knows Switzerland is beautiful but Slovenia might be the most beautiful country you’ve never heard of. Slovenia's tourism industry was re-birthed only 25 years ago when it gained independence from the former socialist Yugoslavia. If my pictures don’t do it justice, consider the chance of beauty in a country where 55% of it is covered by forests making it one of the greenest countries in the world. Bordered by its well-known neighbors - Italy, Austria, Hungary, and Croatia - Slovenia got a heaping serving of big mountains, enough Mediterranean coastline to be meaningful, and more than 260 waterfalls. All contained in an area roughly the size of Massachusetts. And with a population of just over 2 million people, there is plenty of room to spread out. It’s enough to make you say ahhhhhhhhhhh and for no one to hear how loudly you say it. I’m guessing you’ve never been there since of the 4.3 million tourists to Slovenia in 2016 only 2% of them were from North America. Tourism has been rising steadily since 2012 but most of that has come from visitors within Europe. However that trend is now changing. This summer Croatia was crushed with tourists who were avoiding other destinations in Europe due to terrorism fears in Greece, Italy and Turkey, and that increased volume spilled over to Slovenia. We heard a number of people tell us that it was their busiest summer on record. So my advice is to "Just Do It" before the secret is fully out. Slovenia also has a vibrant food and wine scene. Travel and Leisure's story called "Why Slovenia Has Become One of Europe's Best Food Destinations" is an interesting read. Part of that reputation is likely because the Slovenian people are very open to other cultures and they are proud to take inspiration and ingredients from their Italian and Austrian neighbors. While nature and fresh air has been the cornerstone of Slovenia’s tourist draw, it’s homegrown red and white wines (90% of which are consumed in country) and inventive cooking have been creating a good deal of international buzz. So with outdoor activity and good eating as our dual mission, we spent a week in Slovenia in mid-October (for our school Half Term Break.) We crafted an itinerary that had us touch down in four different locations with roughly two days in each spot. Here’s where we went and did and what we might recommend if you were to do the same. The country so exceeded our expectations that we have an itch to go back for a second trip to cover some areas we missed like the Southwest wine region and the Soca River valley. We started our trip in the capital city of Ljubljana. We flew from London Stansted on easyJet to Ljubljana airport. EasyJet is our least favorite airline but for £75 per person round trip, they are hard to pass up. For this trip, easyJet was unusually hassle free and the arrival, rental car pickup and 30 minute drive into the city was easier than many commutes in LA. You actually don’t need a car in Ljubljana which is completely manageable on foot but it was easier to pick it up and park it since we were only spending 24 hours in the city. With a population of less than 300,000, Ljubljana is a charming town along a river with a castle on a hill and green space in every direction. It’s picturesque and lovely and you’ll feel like you are in a storybook (in a good way) but you don’t need more than a day to see it all. I know this to be true because I, being hopelessly directionally challenged, never get lost. We stayed at the boutique hotel Hotel Cubo which I would highly recommend. We got a double room with an interconnecting junior suite for the four of us with breakfast included. There are cheaper options but the location and view from the third floor was great and nothing says “welcome to vacation” quite like a honeymoon circular bed. One of the first things we discovered in Slovenia is that like the Dutch, the Slovenians almost to a person speak very good English. English is the first foreign language they learn in primary school followed by German or Italian depending where in Slovenia they live. It’s the default language spoken with even the European tourists. As the guy at the Hotel Cubo desk told us, “In a country of 2 million people, to survive we need English.” We found this to be true everywhere we traveled and it obviously made for easier communication. The next day we had lunch at the Pivo (Beer)& Burger Fest that was going on in the center of town. Unlike German festivals where every brat and curry wurst is basically the same because the point is more about the festival than the food, this festival in Slovenia was totally about unique craft beers and very unusual burger creations. Last minute intel helped us dodge the horse burger. We just couldn’t. I went for a (confirmed beef) unagi burger that looked better than it tasted but my Human Fish pale ale made up for the miss. The boys had better burger luck. Much to my husband’s delight, the Slovenians embrace their reputation as the environmental capital of Europe. It was demonstrated to us not only by having well-marked rubbish and recycling bins at the festival but they also had staff at each station to insure the protocol was followed. With the trash police's eyes on me, I found the correct food waste bin for the unagi burger. Our next destination was in the small village town of Luce at the base of the Kamnisko Savinjske Alps. This was the “off the beaten track” portion of our trip. If truth be told I picked this area because I had read about a guest house called Hisa Radhua but we found this area to be as gorgeous, if not more, than the more popular destinations. Hisa Raduha is a boutique family-run guest house and restaurant set in a small village on a river. It has been in the family for five generations and started first receiving guests in 1875. That tradition along with the modernization of an old barn, hayrack and tree houses as guest quarters – each with their own hot tub – makes it a romantic weekend destination spot for people coming from Ljubljana. Our second hike was out of another valley, Robanov Kot, which is not a national park but is protected land with a few working mountain farms. We parked at the last mountain farm and then climbed 3 miles and 3,000 feet, through steep alpine sections and along ridge lines, to finish on the ridge of Mt. Strelovec where we also got to sign the registry. At the summit we were treated to an unbelievable 360 degree view of both the Robanov Kot and Logarska Dolina valleys. We saw only one other person on the trail which speaks to how much of a hidden gem this valley is. Our next destination was Lake Bohinj which was was less than a 2.5 hour drive. Lake Bled, Slovenia's most iconic tourist attraction with a lake, castle and church, was in route to Lake Bohinj. Lake Bled is beautiful but with it's proximity to the motorway and easy access from Ljubljana, the area was more built up than I expected. Lake Bohinj on the other hand is surrounded by a national park, less a tourist attraction and more of an outdoor recreation area. Home to what looked like a number of large camps, Lake Bohinj has all the outdoor activities: hiking, cycling, rowing, kayaking, canoeing, rope courses, rock climbing, etc. Changing it up, we stayed at a self-catering apartment called Alpik Apartments in Ukanc, a small recreational community at the Southwest corner of Lake Bohinj. We were the only lodgers the nights we were there. The apartments (of various sizes) are simple, clean, and cozy. It was a great base camp and groceries were only 10 minutes away in the main town of Lake Bohinj called Ribcev Laz. There were only two restaurants in Ukanc which made our two dinners easy to decide on. Though a departure from our fancier eating earlier in the week, traditional Slovenian food is actually quite nice. We had trout from the Lake and beef medallion cooked on the "Green Egg" (who knew the Green Egg had found distribution in Slovenia!) with local porcini mushrooms at Gostice Erlah. Better yet was the jovial waiter Marco who sang Slovenia's praises and told us this had been the busiest summer in the restaurant's 24 years. After two hikes with a lot of elevation gain, the boys were kind enough to oblige me with a flat hike from the apartment and around Lake Bohinj. Bohinj is enormous, warm during the summer due to it not being very deep, home to ten types of fish, and not lined with any holiday homes. What started as a meander around the lake on a well-groomed trail somehow turned into a duathlon day where we rented bikes and ended up walking/riding 20 miles on our “rest day.” We rented cruiser bikes for 1.5 hours from AlpinSport in Ribcev Laz to do a loop around the valley that takes you through some traditional towns and meadows. Highly recommend but probably only for older children as there are some sections along curvy two lane roads. Our fourth hike was climbing again but this time in the Triglav National Park where we did a 7 mile hut to hut alpine hike. We drove to the highest trailhead in the park and did a couple of trails that took us through rocky trails and meadows. The huts were closed for the season but it is also known as the “cheese route” as the huts serve local mountain cheeses. We called it the “Marco Supper Club hike” as we saw two groups we had seen the night before at Marco's restaurant. It’s an easy 1.5 hour drive from Lake Bohinj to Kransjka Gora, the cute village skiing resort at the foot of the other side of the Triglav National Park. In addition to being a fantastic fall hiking spot, Kransjka Gora is best known as the destination in Slovenia for skiing and they are proud to have hosted the World Cup ski jumping championship for many years. The Skipass Hotel is another family run, boutique hotel but this one was built only 5 years ago. It's a 10 room/suites, modern, and very comfortable hotel run by a ski-loving family who started a travel business in Kransjka Gora 10 years before they opened the hotel. We aren’t skiers but Kranjska Gora is apparently the cheapest resort in Europe for skiing and roughly half the cost of a similar trip to Switzerland. Like Hisa Raduha the hotel also has an excellent restaurant that is run by one of Slovenia's best young chefs. It's a fine dining kind of experience where as Hisa Raduha is more like being in some one's home. Offering a set chef's menu, a set Slovenian menu, a set Italian menu, a set Austrian menu or ala carte mash up of the individual dishes, so good was the food that we ate both dinners at the restaurant. When we go flat, we go long. For our fifth hike we did 10 miles following a river valley from the hotel to a mountain hut. The hut (which was open) is the base camp to the start of a climb of two of the biggest peaks in the area. Though mostly flat, you had a feeling of being up close to the peaks. For our last hike we drove from Kranjska Gora to Vrsic Pass along a well-known road with 24 marked hairpin turns on cobblestones. The road which is only open 7 months out of the year is also known as the Russian Road because over 10,000 Russian prisoners of war built it during WW1. Unlike all our other hikes where we felt like we had the mountains to ourselves, this was a festive hike where we saw streams of people of all ages on the trails enjoying one of the last beautiful weekends in October. Cars in the parking lot had license plates from Slovenia, Croatia and Italy. Most of the people were doing the same hike we choose that took you up a high climb, through a saddle and up to a grassy viewpoint that gave you beautiful vistas the entire way. It was a glorious way to end a week of epic hikes. You absolutely need a rental car to get around Slovenia but the roads are good and given that the country is only about the size of the state of Massachusetts, nothing is too far away and so you won’t be wasting precious hours in the car. We flew into Ljubljana which was convenient from London but a local told us that the best value flights to Slovenia are via Venice or Munich. Who knew?! International flights to Venice are much cheaper and more frequent. The Venice airport is outside the city towards Slovenia and only a 2 hour drive to Kranjska Gora. The Munich airport is only 3 hours away. Given the above point, an interesting way to visit Slovenia would be to make it part of an itinerary that included Venice, Munich, and Salzburg Austria OR going the other direction with an itinerary that included Zagreb, the Croatian coastline and Montenegro. There is not much information online about specific hiking trails but we would highly recommend purchasing regional hiking maps from KART GRAFIJA (or borrow ours!) We bought ones for Bohinj and Kranjska Gora from the travel bookstore Stanfords in London which were excellent. The maps combined with local advice helped us discern how to best select from the many hike options available so no day was wasted. Slovenia is one of those places has something to offer almost any time of year. High alpine hiking is as we learned fabulous in fall; late spring/early summer would be a great time for low country hiking, river rafting and the wine region; and winter for skiing and alpine sports. We all have that area in a bookstore where we encounter short term memory loss as to our collection at home. Mine is the cookbook section. A few months ago I was in Waterstones for something I can’t now remember. Instinct took me past my favorite section. 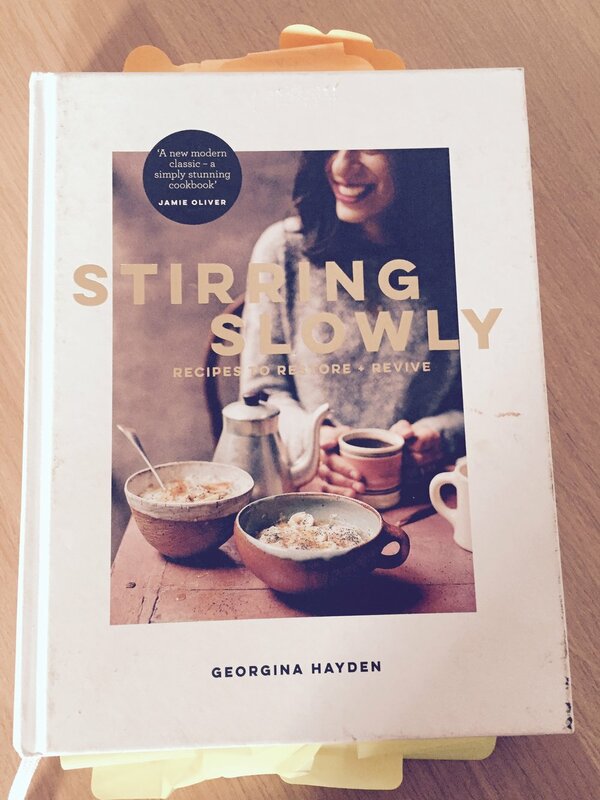 Nudged by the prime table placement, captivated by the gorgeous photography and food styling, and peddled by an exuberant Jamie Oliver endorsement, I left (hopefully with the thing I came for though) AND a copy of Stirring Slowly by first time cookbook author Georgina Hayden. Since then two more cookbooks have been added. The first was because Amazon suggested it to me as they know both my weakness and my vegan curiosity. The second was due to arriving early to my first yoga class and channeling my 15 minutes of nervous energy in the studio’s gift store. When I get a new cookbook I quickly speed read through the recipes and sticky note ones I want to try. I blow past the boring Introduction where every author tells some version of the same story about early childhood food memories with their grandmother. I also skip the Stocking Your Pantry section because by now I have it. I’m all about the recipes and my quest for an eggplant dish my family will finally love. It usually takes me about 12 hours from cookbook acquisition to grocery list. One of my first recipes from Stirring Slowly was the “Roasted Chickpea, Cauliflower and Sesame Lamb.” It was a winner. “Herby Puy Lentils, Greens and Smoked Mackerel” was next and also a winner until I made it often enough that one family member mentioned after 25 years together he thought I KNEW that he doesn’t really like smoked mackerel. I reasoned if you are good with smoked salmon and tuna, smoked mackerel is game on. And on. I made “Sticky Carrots and Beets with Dates” for appreciative dinner company and my only complaint about the “Chorizo, Tomato and Chickpeas on Toast” is that the recipe should have demanded I double it. The “Popeye Smoothie with Mint and Blueberries” elevated our smoothie game and the “Sausage and Wild Garlic Linguine” is now in our regular pasta rotation. What I couldn’t put my finger on precisely was how to describe my new cookbook. As you can probably tell from the recipes mentioned above, it was filled with a hodgepodge of recipes with lots of different ethnic persuasions that made it hard to categorize. I just know I liked what was coming out of my kitchen … well except maybe for the “Khichdi: a traditional Indian dish with mung beans.” The photo wasn’t even promising. But mung beans weren’t yet in my bulging pantry and every cookbook has that recipe you feel sorry enough for to try. The other miss wasn’t the cookbook’s fault. If your family is convinced that the only pancake is a buttermilk pancake, you might want to skip the “Caramelized Apple, Ricotta and Hazelnut Pancakes” to protect yourself from hurt feelings that naturally come after you have pulled out the food processor, apple slicer, sieve, and electric beaters at 8am on a Saturday morning. Inevitably what happens after cooking through my sticky notes and removing the aspirational ones, I often hit a wall with a new cookbook. That happened a few weeks ago with Stirring Slowly. That’s when I crowdsource by doing a Google search to find out what other people have made and liked from my fading favorite only child cookbook. It always turns up a few good new recipes to try. That’s how I discovered the “An Insanely Good Blondie” recipe that somehow I had missed. And it was insanely good according to a ravenous group of 11 year olds who forgot to leave me one. The Google search turned up no mentions of the mung bean recipe for good reason but it did tip me off to something else. Somewhere, deep in a comment thread, someone made mention of the author’s, Georgina Hayden’s, tragic loss. Curious, I searched further but couldn’t find any more details online. So I flipped back to the Introduction of my now well-worn cookbook – the pages I had skipped over. There after several paragraphs into a standard intro, Georgina detoured and shared how this cookbook, her first one, was born out of losing her son just before birth. I had completely missed this detail. One not directly important to my cooking per say but nevertheless very important to the author. I felt terrible for her loss in the way you do when you hear sad news about a stranger. I don’t even know this woman. And yet this woman had indirectly helped me put food on my family’s table for the past several months. I was so focused on finding recipes, shopping for and then measuring out ingredients that I never considered the context for how these recipes might have come about. I didn’t think about the person behind the cookbook. I thought about how it was serving me and how I would serve it. I noticed how that little piece of information shed so much more light. That’s why there were so many soups and one pot meals. Oh, I get it now. The wide range of recipes with varying levels of difficulty that defied a tidy label. Oh, I get it now. I’m not writing this post to beat myself up about not reading a cookbook introduction. I have way bigger failings than that but the story has burrowed in me for another reason. It makes me realize that one small but important piece of information about someone can completely shift something into better focus. When we think we know something, we skip ahead. We don’t ask obvious questions or the question sitting just below the surface. Instead we race ahead to find our perfect recipe rotation for purpose and passion and then collect the ingredients we need. We focus on the data and the measurements. We create output. If other people factor (and they always do), we go straight to figuring out how they can be of service to us. We aren’t meaning to put people into boxes but we forget the fullness of every single person we encounter. We forget about the person behind the book, the counter, the computer screen. That what they are saying or doing comes from experiences they have had. Of course we can’t know everyone’s story and few people will ever hand us a written introduction of theirs, but aren’t we all some version of a story of love and loss? And if we really, really believed every person has missing puzzle pieces we may never be privy to, doesn’t just knowing that cause something to shift in us that brings us past tolerance and closer to respect and genuine conversation. Now when I cook from this cookbook, which isn’t any more or less than I used to, I picture where in the healing process the author might have been when she wrote a particular recipe. I imagine many of the recipes in the “A Sunny Start to the Day” helped her get out of bed on hard days or the surprising numbers of celebratory cakes were byproducts of a disciplined gratitude practice. The insight into Georgina’s story has made me both appreciate her recipes more and cook with a little more intention. It’s a small shift but I can’t help but think it makes me a better cook. We will only know when I try the “Caramelized Apple, Ricotta and Hazelnut Pancakes” for a second audience. But mostly it has challenged me to see people who I can't quite put my finger on as more than meets, at a bare minimum, my eye. I don't have to tell you there are lots of places where you can practice this. We all have our lists. Also, that cookbook I recently picked up at the yoga studio … I read the entire Introduction. One of my memories about heading out the door for school was my Mom reminding us that she had spies watching us. She was someone who knew the neighbors. Mostly their job was to report if we took our hats and coats off before getting on the bus. For a few years, until big hair and jean jackets made hats and parkas untenable, "Operation Stay Warm" worked. Last week our 10 year old son shared something about his life that he hadn't told anyone in detail before. He told his 14 year old brother first, who in a fine display of teenage grace, thought it was really cool. That something was that our 10 years old has been in a movie for as long as he can remember. We've heard him mention his movie a couple of times over the years but we didn't know how active the movie was playing out in his daily imagination. He says the movie started when he was born but he only became aware of it when he was about 6 years old. But the most fascinating part is when he explained how being in a movie affects his life. He said that knowing people are watching makes him want to work harder and not cut corners. (This is so much better than spies!) And that even though the people watching his movie have seen him make mistakes and have meltdowns, they still keep watching because they are with him for life. Also the audience will always be the same 15 people, even if his life gets way more interesting. It's like having an angel on one shoulder, a devil on the other shoulder and a small brigade as a cape. Many of us believe in a visible and invisible world but few of us know how to articulate it. In the unique way only a child can, Lawton has painted a picture of what that duality might look like. A world where you are the Director and Actor of your own movie but there is a committed audience to your every move and their role is to help you bring out your best self. If I had to guess, the “I’m in” moment happened over a shared plate of Dutch pancakes. This past Monday had been a lazy summer morning. We weren’t on vacation. Nothing except for a routine doctor’s appointment at 9:30am was on the calendar. It wasn’t until noon that I engaged with my three boys on a plan for the day. I casually suggested a free museum. They forcefully rejected the idea on the rational basis of “summer + London + tourists + 1pm.” With rain threatening, we made the uninspiring decision to go out to lunch. Because I am the Mom to three boys, lunch also involved us breaking into two teams and racing to the lunch destination. And because I am The Mom, I shackled Team Tube with an errand on the way. Team Bus won although there was some debate about possible unsanctioned running. It’s hard to go wrong with a lunch featuring guacamole, street tacos and a restaurant foosball table. But what surprised me was the unexpected constellation of “Ok, yes, and sure” after lunch when I suggested we check out the neighborhood and walk the two miles back home. Whether it was due to tortilla guilt or the siren song of a vegan brownie, our longest stop on the way home was at a mega Natural Food Store. Hanging out in a Natural Food Store for 30 minutes with my 10, 14, and 19 year old sons was certainly not something that had happened before. We left with two bags of groceries we didn’t really need, most of them experimental snack foods we had all helped pick out. Enter the Dutch pancakes. In an attempt to cleanse the seaweed palate and make up for the Natural Food Store’s try at a carrot muffin, we made a final stop at our neighborhood street food market. We stood outside the Camden Market and ordered a large plate of 15 Dutch pancakes with powdered sugar for the 4 of us to share. It’s hard not to feel grateful for your little tribe when you are standing cheek to cheek over a plate of doughy goodness, toothpicks in hand, and no one wants to take the last few for fear of taking more than their fair share. Overcome with a feeling of love that is hard to describe but sweeping in its power, when the plate was finally empty, I took it and dramatically poured it over one of my son’s head dusting him from head to toe in powdered sugar. It surprised me as much as it did them. What under other circumstances might have been considered impulsive or embarrassing was received in the spirit given. They all laughed. Hard. Then much later..
That feeling I had when I poured the powdered sugar over my son’s head. They felt it too. And now they were christening me back. It’s not a mystery that the soundtrack of love still plays on ordinary days. Most days we don't hear it but some days we hear it and on very special days, we hear it together with the ones we are trying our best to love. Stage 1: A seed is planted. Careful accounting of a potential extra income stream was not the reason we started talking about the prospect of a holiday house. This view was. This picture was taken in Andalucia, Spain in 2013 on one of our very first trips in Europe. It was young love at first sight. Here’s the story of our first date. Stage 2: Fire hose watering. What generous people would call the brainstorming phase, husband’s of wives with an internet connection and blind love for the words “villa” and “finca”would might call the crazy house hunting phase. This was about a year long period when I found about 30 *perfect* houses where search parameters = nil and I seemed to keep forgetting the reality of three still to pay college tuitions. Stage 3: Plan to paper. Adhoc approaches may work in finding your next vacation destination but once Spanish property law starts encroaching on your intraweb searching, you know it’s time to get sangria-serious. At some point, wanting to buy a holiday house in Spain because of the climate, friendly people and olive trees isn’t enough direction for the search box. It was through this phase and the accumulation of many more travel experiences in Spain and elsewhere that brought necessary parameters to the search. Honestly, we wanted to find a place that brought us a sense of rest and peace that our first trip to Andalucia inspired and to be able to share that experience with others. The parameters ... The vast majority of foreigners considering property in Spain naturally look along the coast, particularly the Costa del Sol which is much like Florida. We however went the less popular direction and narrowed our search to inland property in either Granada or Cadiz province, a property within 5-10 minutes of a village, 10-20 minutes to a town with services, less than 90 minutes (ideally 60 minutes) to the coast, a major tourist attraction in Spain, and to an airport. We were also looking for a smaller sized property surrounded by protected land with open vistas of hills and/or mountains, and an already redone comfortable property connected to water, electrical and high speed internet with an existing holiday rental track record. In short, we were looking to find a needle in a sea of white villages. This is the phase where week after week you get the “Sorry, we don't currently have any property matching your criteria.” and you start to think that maybe it was Italy you really fell in love with. When you are least expecting it, a casual refresh button on a dream sometimes yields a result that looks like this. After several years of casual browsing, this was the first and best priced property that ticked all of our boxes and then some. 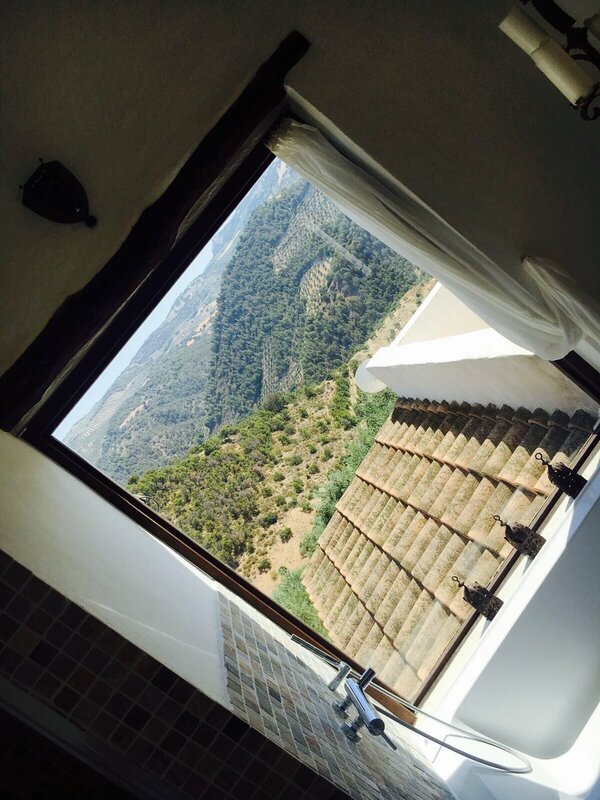 The matching proof ... Not only does this property have the most stunning views of the Andalucian countryside but it also has views of the snowcapped Sierra Nevadas. It’s within a 10 minute drive to Montefrio, recently named as one of the ten best views in the world by the National Geographic magazine. 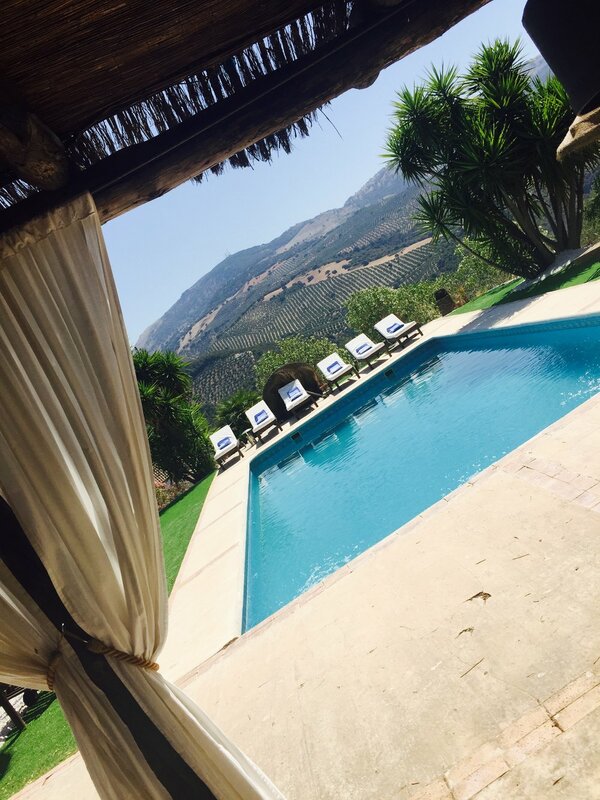 It is a 40 minute drive to the major tourist attraction of Granada and the Alhambra, a 60 minute drive to the coast, and 90 minutes from Malaga airport. The property is less than one acre with 6 olive trees, 15 almond trees, and 3 fig trees in production but with the acres of protected land around it – it feels like the mountain version of being on your own deserted island. Comfort, connections, and turn-key rental business also checked. This is when the spreadsheet comes out and you gather the courage to send your first inquiry email. In this case it was directly to the private seller who is a British family who restored the cortijo themselves and who patiently answered all my detailed questions. Through the back and forth, it was clear it was a property I needed to see in person. I also sent an email to Andrew Forbes, the owner of the first house we stayed in in Andalucia. As a foreigner who has bought a house in Spain and a travel compatriot, Andrew had lots of good advice including this: “Buy the house or any house in Spain because you love it - don't buy for investment - too big a risk.” He also told me to be aware that this part of Spain is very, very hot in summer. And as serendipity would have it, Andrew had actually visited this property once when a friend was renting it and had written glowingly about it on his blog. Stage 7: Reality Meets Dream. It is wise to bring a wing man when you are chasing a dream. As my husband was working, he suggested our 19 year old son come as his surrogate. Not only was Quinn a fantastic traveling companion and navigator but in one of those parenting inversions, he was the voice of reason and comfort when my anxiety got the better of me a couple of times. The flight time from London to Malaga is normally a manageable 3 hours but for our journey … the trains to Gatwick were delayed ... the computers for passport control weren’t operational when we landed in Malaga causing queue unrest ... then there was my driving for the first time in 7 months .. in the dark… with the GPS not working … me yelling at my son instead of the GPS …around spaghetti freeways … in a tiny Fiat that had no pick up when I floored it … getting pulled over by a police officer for having the brights on and saying “Merci” instead of “Gracias” … needless to say, in your dreams – you forget the travel hassles. And we were only coming from London. Right, the flight time from Seattle to Malaga is 15 hours. Noted. The 90 minute drive to the property the next morning was better. We arrived exactly on time and were greeted by the owners who graciously toured us around this place they had so lovingly invested the last 10 years in. Quinn eagerly snapped photos and videos as I asked questions. The property, and especially the setting, was even better in person than in photos. We called Brett excitedly after the house visit and our lunch in Montefrio. But, by afternoon the known reservations we had talked about during the paper exercise hit me like a two-by-four. Quinn hashed it out with me for hours as we spent that evening walking the streets of Granada. As much as I loved the property and the potential, I couldn’t image my family and friends from the USA spending the time or money to get there. I couldn’t imagine us getting there when we move back to Seattle. And even though there was a great rental history and support infrastructure, I couldn’t imagine managing a property from that far away. I didn’t want what started as a dream of a place of rest to become a burden. And Andrew wasn’t kidding: it was hot. Too hot. But it took me being there to understand it at a heart level. Italy is always a good idea. An island in Italy before the heat and crowds of July and August is a jolly brilliant Half Term School Break idea. In terms of island size, Sardinia is like the Ohio State of universities. In the same way you would only know a small percentage of your classmates after 4 years you can only cover a fraction of Sardinia’s vast natural beauty in 4 days. Sicily, another place we have seen a sliver of, is bigger but Sardinia is still the third largest region in Italy with almost 2,000 meters of coastline. This then is fair warning to balance this post with a more authoritative source on what not to miss in Sardinia. First, don’t assume because the Olbia airport is small you will transit through it quickly. Even if you are the only flight to land at 8:30pm on a quiet Wednesday night. It took us one hour, a portion of it (weirdly? unsafely?) standing outside adjacent to the tarmac, to get through the two men/one chatty supervisor passport control line. Either it’s payback for having chosen EasyJet or a welcome to island time. I wish I could report I managed the wait time with an attitude of dolce vita that every other person not holding an American passport seemed to be capable of but my countenance was unmistakably prima donna. My Global Entry passport carrying husband wasn’t doing much better. Thankfully our children, who haven’t had as many years to be conditioned for efficiency and customer service, recognized the daggers darting from our eyes to the supervisor and redirected us. By the time we reached the front of the line, our impatience had melted but our hunger for pasta had kicked in. Second, because it is Italy and food is central, a late arrival is “no problem” for the kitchen. Not only was the restaurant at the farmhouse we stayed at happy to serve us dinner at 10pm but the owner delayed her departure home for the evening so she could welcome us. Guided by our gracious, grey-haired, quadrilingual Italian waiter, our first bottle of big but not bossy Sardinian red wine was at our table by 10:10pm. There are many agritourismos/farmhouses scattered throughout Sardinia. 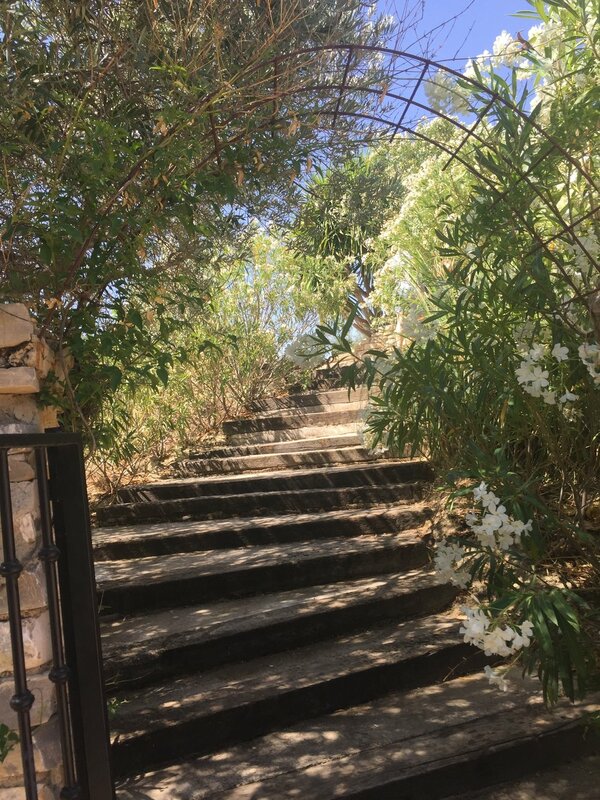 We choose Stazzo Lu Ciaccaru, a relaxing rural hotel with 10 suites, a great pool and grounds, and easy car access to a variety of sites in Sardinia’s northern tip. It was a lovely choice and one we would recommend but there are probably many in the same vein. Like the masserias in Puglia where you can follow coastline for miles on end, if you had the time and inclination Sardinia is the ideal place to cover more ground by hopping from farmhouse to farmhouse by car, motorcycle or road bike. Unlike other trips where we work to find special restaurants, we allowed ourselves to settle in to Stazzo Lu Ciaccuru for all but one of our four dinners. We all took turns ordering the risotto with local pecorino cheese (80% of Italy’s pecorino comes from Sardinia), gnocchi with sausage ragu, tempura sardines, and the highlight was a Friday night grilled fish set dinner. While Sardinian food didn't stand out as much as the food from other Italian regions, it did offer a little bit of everything. We skipped the maggot cheese and donkey meat. Rather than park ourselves at one of the stunning beaches along the Costa Smeralda to soak up the sun (which was in full supply in early June), we decided to hit the hiking trails along the Northern coastline and mountainous interior. A car rental and a willing driver is therefore critical for this kind of trip. However, as Sardinia is the only region in Italy without a motorway, the continuous landscape payoffs along winding but mostly generous two lane roads appeals to even back seat passengers. Lucky for us, the traditional village of San Pantaleo which sits high between movie-set like granite mountains, has a weekly market on Thursdays which was one of the days we were there. We were expecting fruits and vegetables but this was that plus truly special artisan crafts, clothing and jewelry. We later learned that San Pantaleo is the inland playground for the glamorous people who come to the Costa Smeralda. After wishing there was room in our suitcases to bring something back and a lunch at the local pizzeria, we spent the afternoon scrambling around rocks, cliffs, and sand to see the best jaw-dropping natural beaches (the ones that don’t rent beach chairs and often require a short walk to get there) along the Costa Smeralda: the interconnecting beaches of Capriccioli, Romazzino, and Portu Li Coggi. With only one afternoon, we intentionally avoided glitzy Porto Cervo, the resort heart of the area but we wished we had made it to the long walking beach of Liscia Ruia. Designated national parks and wildlife reserves take up 25% of the island. When we were told by the farmhouse (we think erroneously) the only way to tour the main islands of the Maddalena Archipelago was via chartered boat, we opted instead to drive inland to Monte Limbara. It was a place that jumped off the map at my husband but largely skimmed over by the guidebooks. The husband was right. From Vallicciola which is roughly 2/3 up the mountain, there are several well signed trails that lead you through dense forests and ridge lines to the highest point in Northern Sardinia for some grand views. Apart from an epic thunderstorm that had us take cover for 45+ minutes, the 5 mile hike we choose was one of the best hikes we’ve had in Europe. In route from the farmhouse to Monte Limbara, we detoured to see a lake we had read about as a hidden gem which was ho hum (Lago di Liscia), stopped in a cork forest near Calangianus, and circled a number of out of the way, gorgeous roads on the map should we ever return on bikes. With the delay and drenching of the thunderstorms, we skated by the town of Tempio on our way back but it seemed a look-see town. Trading the inland mountains for coastal granite rocks, we spent our last day hiking in the Northwest corner of the island in an area called Punta Contessa Park and Capo Testa a few kilometers from the town of Santa Teresa Gallura. A small isthmus separates the two areas, best described as massive granite rock sculpture gardens. We passed on the easy “A” and “B” routes in favor of the more challenging but rewarding “brown Natural Trail hike” which dipped and turned through rocky outcrops and scrubby vegetation, delivering countless dramatic views of nearby Corsica, for about 4 miles. It was the kind of hike that makes you glad for a large camera memory card and sympathetic companions for when you inevitably twist your ankle because you are too busy looking out instead of down at your scrambling feet. The town of Santa Teresa is an easy one to navigate and enjoy for a post hike lunch and a good pivot point for the nearby beach and dunes of Rena Maiore. Like so many places in Sardinia, it turns out that Rena Maiore deserved more than an afternoon drive by. Though gelato fueled, there wasn’t enough gas in the tank to hike the cliff hike trail that extended generously in both directions but it was a great place for a late afternoon swim and a circle on the map for another time. The process of making all new friends simply takes time and that time is further protracted when you live in a big city like London. Spending 3.5 hours of transit time like I did recently so your kid can have a 4 hour playdate with a new friend demonstrates the hard realities of navigating new friendship in a big city. You want to say "yes" to every invitation but you'd also like to make it home by dinner. It’s a known downside to this otherwise exciting life. This is one of those weeks where I’ve felt it more than others. I know I will “get there” with some of the wonderfully warm people I’ve already met (and more still to meet) but it’s not like college (or even a small community like Luxembourg) where insta-friendship develops because you’re all in the same boat together. My feeling of impatience this week probably has something to do with my husband being gone for 8 days sending gorgeous pictures from Tokyo and having spent time with an old friend who knew me when … back when I used to see the world in mostly black and white and who understands and shares the world I now see in more color. Common wisdom teaches us that gratitude is good for our mental and physical health. It has helped this week. Normally we practice gratitude as a transactional checklist of things to be thankful for but this week there have been two things that keep bubbling to the surface, providing a kind of extended release of gratitude. Better than any endorphin surge after a long run or sip of perfectly crisp Sauvignon Blanc. The first thing that happened this week was when I was working at the homeless Shelter. The woman who runs the Shelter asked me if I wouldn’t mind popping upstairs to where they distribute clothing to see if there was an extra backpack. She wanted to give the backpack to a young, immigrant woman who was new to the shelter and carrying several plastic bags. As I don’t normally do the clothing, I had to be directed where to go. Upstairs they take guests one at a time every Wednesday, Friday, and Saturday to fit them for up to three new articles of clothing. When I got upstairs, they were just finishing up with an older gentleman guest who I knew from the breakfast line. He was beaming as the proud owner of a new suit, one to replace the ratty sport coat he had on and to keep company with his worn-out fedora. As I watched the volunteer neatly putting the suit back in its protective cover while another volunteer went in search of a backpack, I recognized the Nordstrom label on the cover. It was my husband’s suit. I had brought it in weeks before. Of all the Wednesdays, Fridays and Saturdays, I was summoned to bear witness at the exact moment where my husband’s simple act of giving joined with real, heart-pumping, human need. It sent a shiver up my spine. And then …I returned downstairs with a small, very dingy backpack. In route to deliver the backpack to the young, immigrant woman I was stopped by one of the regular guests – an English woman who has been on the streets awhile and who fills a space with her loud and occasionally combative personality. She looked at the small backpack and the young woman’s overflowing plastic bags and led me to where she was sitting. There I watched her empty her much larger, much newer backpack and put her stuff into the too small, soiled backpack and told me to give the woman her backpack instead: “It’s an Adidas backpack! It has much more room for her.” This time I was bearing witness to a more costly act of giving, done without a flicker of hesitation. The young woman’s need was greater than her own and so she did what she could. As the middle woman, I wasn’t even one of the actors in this story and yet this story keeps filling me up and quietly asking me if I am doing all that I can. I’ve read his text several times this week. As most of us parents do, we wish not just for our children’s happiness but that they are able to find deep contentedness. Part of that journey toward a contentedness that isn't tied to accomplishment or experiences is learning how to be “alone in the bright sun without a soul around.“ Which is, interestingly enough, where this post started. Our kids can be our best teachers. So can bearing witness as a middle woman or man. I have this feeling that maybe I haven’t been doing all that I can. Of course there is more I could be doing. Instead of waiting for a call back, I can make a call or send a text. This week I heard the Franciscan priest Richard Rohr say that he prays for one good humiliation a day so he can watch his reaction to it. Moving to a new city makes that prayer comes true without even having to pray it. So now that I am at the end of this week, I can say that I’ve had way more than 4 new interactions with people --and several well timed texts and calls even today -- and thanks to my son’s good advice, I am choosing to love it! A guy I recently met, Pedro, sketched this too kind portrait of me. With sculpted eyebrows and visible cheek bones, the portrait is a more complimentary take on what I look like in person. It also makes me look way more serious than I really am (I thought for sure I was smiling most of the time!) and curiously like I’m wearing overalls. Likewise, this post has the potential to be self-congratulatory and overly serious without a bit of context. So … in keeping it real: 1) I am wearing a blue disposable apron. 2) I know many people for whom service and volunteering is as natural as breathing. I’m not one of them. I’m one of those people in a new city with disposable time on their hands. 3) Pedro is an artist and also homeless. Every Wednesday I volunteer along with about a dozen other regular volunteers in a day center shelter for the homeless which serves anywhere between 75 and 100 guests. The shelter is in a beautiful old church with high ceilings and stained glasses windows, an equal to the opulence of the neighborhood it resides in. On Wednesdays and Fridays, the pews are moved round to make room for tables, seating areas with couches, a coffee bar, a ping pong table, an art corner. It's a place to hang out, charge phones, borrow a computer, read the newspaper, sleep and eat a big breakfast. Twice a week the church becomes a big, aromatic, very much lived-in living room without another analog in the neighborhood. Wednesdays have become one of the highlights of my week. Actually that’s not entirely true. The first week was magical. It was as if I walked into a place where I knew I was supposed to be. I fit right in with the other volunteers, got the easy job of serving sausages, and felt welcomed by the guests I was supposed to be serving. The first week one of the more sociable guests asked me: “So what skill do you bring? Do you cut hair? Or help people find jobs?” to which, because I was buzzing with delight in having found my place, answered, “Nothing really --- except maybe my smile.” It seemed enough of an answer for him and a good enough reason to come back the second week. The second week was all topsy turvy. I realized that some people who I thought were guests were actually volunteers and vice versa. I was doing that thing we do where we assess people based on appearance and other external factors and came to discover I had gotten several people wrong. In a way though, that discovery was like a whack-a-mole reminding me that the line between who is giving and who is receiving is a thin one. We all are on different sides of that line at different times. The third week security had to ask a few guests who smuggled alcohol in to leave. In truth, that probably happened my first week too but I hadn’t noticed it then. I was so mesmerized by the light shining in through the windows, my being “of service” that I missed the messiness of sharing a big, aromatic lived-in living room with people who don’t have a living room every day of the week. I didn’t see how even among the homeless, people cluster with their own kind and how there are cliques. Homelessness is a complex issue without easy fixes. Of course, I knew that the first week but as the weeks wear on, the knowing moves from your head to your heart. The more you learn about the guests, the more you start to understand the host of reasons people get stuck. Other weeks I’ve had the hard job of serving the scrambled eggs, the most popular item that always runs out first. I’m easily persuaded to serve too generous a portion on the first helping to those who ask, as if scrambled eggs served with a smile will somehow tidy over the despair in their eyes. But then I remember that I told James the first week that I’ve brought my smile, my contribution, and I can’t let up even when my heart is weighted down by what I see. I’m getting better at telling the few pushy ones to wait for seconds. The shelter is a messy place where sadness doesn't have a lot of places to hide. I’ve had meaningful conversations with people, bizarre conversations with people, funny conversations with people. I’ve had a heated conversation with someone where a young woman volunteer with Down’s Syndrome hugged both of us and told us she loved us with every volley of the conversation. I’ve witnessed outright, hurtful racism. I’ve witnessed simple acts of friendship. I’ve seen one of the guests in a completely different part of town on a park bench, who I warmly greeted, only to be shaken awake realizing that might be his living room for the night. But then I saw him again the following Wednesday and we didn’t talk about where he slept that night. We talked about Seattle; a place he once visited, and had he possible met me there in 1993? I told him it was unlikely. What I didn’t tell him is my 1993 eyes didn’t have the same focus to see people like him. Every Wednesday after breakfast it looks as if the crusted over porridge pot will never get clean. Even after a hot soak, the layers of burned on porridge seem too much for the best elbow grease. But every week the impossible happens. A volunteer, of various strengths and sizes, muscles their way through the sticky porridge pot and it comes out looking shiny and new. A couple of weeks ago, my oldest son who was visiting from college and came to the shelter with me, got his turn with the porridge pot. Last week I offered to do the washing up but another volunteer said he would wash if I dried. Different than me, this volunteer was once a guest, obviously in a very sticky life situation I only know vague details about. Watching him wash up as we talked, making it look more effortless than I’ve experienced it to be, I was reminded that people are like pots. We all have layers of burned on crust but with the right mix of desperation, determination, and daring – the impossible can and does happen. None of us are too far gone to be returned into something shiny and new.